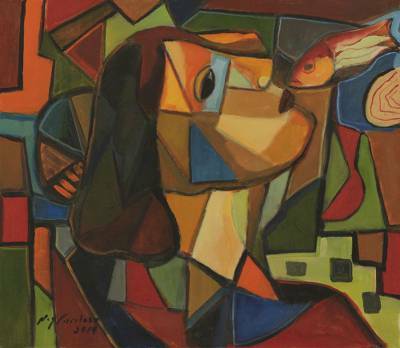 Brazilian Cubist Portrait Painting, "Fishing with Passion"
Inhabiting a mysterious underwater world, a woman offers a kiss to the beautiful fish that swims near her red lips. Abstract shapes in brilliant colors surround her with the passion of fiery hues. This elegant painting is the work of Ney Cardoso in Brazil. Titled "Pescando com a paixão" in Portuguese. Ney Cardoso's artistry has been featured in various periodicals. Ney Cardoso's artistry has been featured in magazine and newspaper articles in the United States. "When I was 8, I saw a classmate painting and decided to show him what I had drawn – sketches copied from a comic book. Everyone enjoyed my sketches so much that they didn't believe I'd drawn them myself. This was a good sign to be sure! When I was 17, I entered the Fluminense School of Fine Arts and since then have not stopped drawing and painting. "I have an insatiable desire to paint. My brain yearns to be filled with different ideas and themes, ideas that usually come from my daily surroundings – from films that I have seen, from paintings that I've particularly enjoyed and books that I've read. There's nothing better than observing people in urban settings. I love traveling to the city and blending in with the multitude of people, observing them as they unknowingly pass by my keen eye. "Van Gogh, Picasso and Matisse are my huge inspirations. You can notice their Cubist influence in my work. You can also see van Gogh's influence in my use of emotional color. I frequently approach the theme of interpersonal relations, often between women. Women fascinate me with their beauty and mystery. I like to bring this beauty, mystery and interest to my canvases, often rife with human conflict and emotion." "I am proud and happy to be highlighted in the Dictionary of Brazilian Artists, written by the prestigious Brazilian art writers Ayala and João Medeiros, and grateful to Novica for helping me gain international recognition. I work best while listening to music of various genres including classical, rock and Brazilian popular music – especially music by Brazilian artists such as Caetano Veloso, Chico Buarque and Chico César." Sr. Cardoso, your painting of faces (2007) has hang in my small study, flanked by turquoise glass masks from Mexico. I love the fact that there's so much going on in the painting, I see new things each time I look at it. I also have your girl with a butterfly in her hair, a picture of joy and innocence. Please continue to amaze us with your talent. Anyone who has a love of color, composition and sheer joy in life will be drawn to the paintings of Ney Cardoso.He paints with the true spirit of the Carioca and while I already own two of his works, only wall space and money prevent me from buying more; but then, you never know . . .